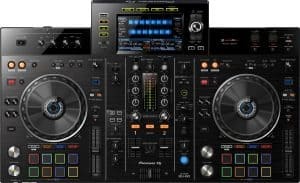 Check out the six best DJ setups for beginners and find out why the controller setup could be the best choice, and the best value for money! When you first begin DJing, buying equipment can be a little overwhelming. With so many different setup ideas and lots of equipment to choose from it's hard to know where to start. Choosing the best DJ setup for beginners may seem complicated, but we'll go through everything you need to know. From traditional setups to digital DJing. We'll also take a look at some of the most popular equipment on the market for all budgets. When you start DJing you'll want to keep things simple. There's no need for complicated controllers or mixers, so a 2 channel mixer/controller will be perfect. Buying high priced DJ gear isn't always necessary either, so if you're on a budget you'll do just fine. The industry standard CDJ-2000 NXS2 with a DJM-900 NXS2 might sound nice but there are much cheaper units that will do the same job. Some of the finest DJ's I know started out DJing on budget equipment. First we'll look at DJing equipment, then after we'll go through speakers and amplifiers. This is the simplest form of hands-on DJing. The two multi players play your music and the mixer will be used to transition between both. This is a simple 2 channel setup as you have 2 sources that will be supplying your audio. The equipment pictured above comes into the budget category and I even have a full review on the mixer HERE. The CDJ-350 are pioneers lower priced units but are very capable and reliable. You'll be able to play from CD's, USB sticks, and Pioneers Rekordbox software (We'll talk about software later). Next up in the best DJ setup for beginners we have the most popular choice - a controller set-up. This set-up uses a laptop and a DJ controller. Your music will be played directly from your computer and mixed with the controller. Controllers do not allow playback of CD's, instead DJ software is used in conjunction with the controller. When you open the software you will drag and drop music tracks to the onscreen decks. As the track plays you'll be able to control everything via the controller. You'll even have the ability to add samples and effects to your sets! They even come bundled with software and a built in sound-card. This means you can simply plug and play via your laptop/PC's USB port. You wont need any special kind of laptop and if you already have one, it should do just fine. So this could well be our cheapest choice in the search for the best DJ setup for beginners. If you are on a budget choose wisely because there are some poor controllers out there. See my article for the top 10 choices for all budgets HERE. I also have some budget controller reviews HERE and HERE. Both of these choices come highly recommended for beginners. Next up is the second traditional setup that's still very popular, especially with turntablists and scratch DJ's. The traditional turntable set-up is what I started with back in 2006. I believe there's no better way to learn beatmatching than with turntables. If you can match beats perfectly on turntables, you'll never have a problem beatmatching with more modern equipment. The setup works exactly the same as the CDJ setup that we looked at first but you'll be playing vinyl records. The only downfall of this setup is that you'll have to buy expensive vinyl, and find somewhere to store them all. If you already have records, perfect! If not you'll be interested in the next setup below. 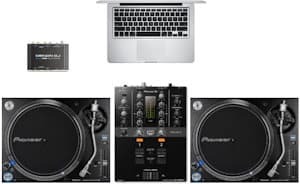 But this set-up offers the simplest form of DJing in our hunt for the best DJ setup for beginners. The equipment pictured above is the Pioneer DJM-250 MK2, once again my full review is HERE. The turntables are Pioneer PLX 1000, check the price and see my review/Technics comparison HERE. This setup is called a digital vinyl system (DVS). It lets you play music from your laptop using special timecode vinyl. You can also use multi players instead of turntables using timecode CD's. You'll need to buy software just like we spoke about with the controller setup. 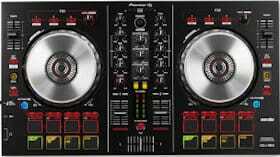 But if you get the Pioneer DJM-250 MK2 that you see in the picture the software comes bundled for FREE. So you can simply plug and play for easy set-up! If you use a normal mixer without DVS capabilities you will need to buy a sound card. That's the other thing you can see in the picture. 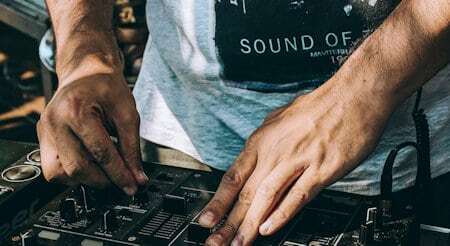 If you need a sound card you simply connect your mixer and turntables to it, then plug the sound card in to your laptops USB port. Next we have a controller + turntable set-up. Again, this is very popular because you really get the best of both worlds with a mixture of old school and new school. This setup is still simple enough for beginners, but it brings a lot of extra features and possibilities with it. If you're just learning I'd suggest sticking to one form of DJing until you're happy with your progress. So if you choose this setup learn to beatmatch and mix with the turntables first. Once you're ready then you can start to incorporate the controllers functions into your sets. Taking it slowly and one step at a time will help you progress much quicker than trying lots of things at once. So what do we have with this set-up? Your controller will act as the mixer, you'll want a controller with 2 phono/line inputs. This is where you'll plug in your turntables. If your chosen controller has a soundcard you'll be able to plug it straight into your laptop/pc. If not you'll need a separate sound card. But don't worry as most controllers have a built in sound card, just check before you buy. It has the necessary phono inputs and a built-in sound card. It also comes with the full Pioneer Rekordbox DJ software. But to use the software as a DVS you will need to buy the programs DVS add on that you can read about HERE. This would make a fantastic setup that would last you for many years as you progress. This setup can also be used with multi players instead of turntables. All you have to do is switch the controller over to line input on the rear instead of phono. If you don't have the space for a hands-on DJ setup you can use something that most of us are using right now. Our phones! Or even a tablet! Or simply by using the same software as we use with a hands-on setup. But we will be mixing internally using the software's interface without the hardware. There is some great software available and even lots of free apps. You can take a look at my favourites in this full list > HERE. You'll find desktop programs, apps, and the usual hardware based programs. These programs are opening up new possibilities for people that have always had the dream of DJing. People who couldn't afford the hardware, or people that never had the space can now make their dreams come true! You'll be able to mix, record, and even throw house parties using nothing but your phone, now that's cool! Next up in the journey of finding the best DJ setup for beginners is the sound system. Once you have your DJ setup you'll need some speakers to bring it to life. You can use an amplifier that will connect to the master output on your controller/mixer. Or you can use my recommended setup of active speakers. Active speakers or powered speakers already have an amplifier built-in. This means you can plug them straight in to your mixer without any other equipment of cables to trip over. I've been using a set of Pioneer DJ Bulit8 speakers for a long time now and they've been great. They're active so no separate amplifiers are required. They have 8" woofers and put out some serious sound. They're super bassy and also have crisp sounding tweeters that are important for DJing. They're designed especially for DJ's and have the necessary connections to plug straight into your mixer/controller. (Update April 2018) I recently purchased a set of Behringer B210D Eurolive active speakers and they are amazing! if you want a quality set of speakers you will not be disappointed. Check them out on Amazon here -> Behringer B210D Eurolive active speakers. So your setup is up and running and the last thing you'll need to begin mixing are some headphones. There are some great budget headphones under $100 like the Reloop RHP-15. Or you can get the more expensive, but built to last Pioneer HDJ-2000MK2. 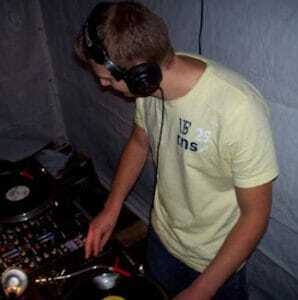 When I was learning to DJ I went through a lot of budget headphones. You will be surprised how fast they wear out. The material around the ear pads and headband split and wear out from constant movement. I probably could have bought two or three very expensive sets of headphones with the money I wasted on cheap ones. So it really is worth spending a bit more on them to avoid buying multiple times. Look at things like frequency response, driver size, noise cancelling, and the materials they use. The wider the frequency range the better and you want a decent driver size, 50mm are perfect. Materials like polyurethane are usually pretty long lasting and easy to clean. The headphones I'm currently using are the V-MODA Crossfade LP2 which are absolutely brilliant. The sound quality and comfort are like no headphones I've ever tried. Find out more about these in my DJ headphones article > HERE. You'll also find a full buyers guide to DJ headphones at the start of the article! You now have the best DJ setup for a beginner! So there you have it, the quest for the best DJ setup for beginners is complete. You now have a great list of setups and gear ideas to kick start your DJing journey. I hope you enjoyed this article, let me know which setup you chose in the comments below. Once you have the setup of your dreams you can come back and learn how to drop your first mix. Check out my definitive guide for all you need to know about mixing > HERE. And for all of my top tips for beginner DJ's check out THIS ARTICLE. It sure is nice to know that for those who want to buy headphones for DJ-ing, one should look at things like frequency response, driver size, noise-cancelling function, and the materials they use. My brother mentioned that he is interested to learn about DJ-ing but he has no idea how to choose the headphones that he should buy. I’ll mention this to him so that he will know what to buy for better results. Additionally, I’ll encourage him to try out beginner DJ courses so that he can learn more about this craft.